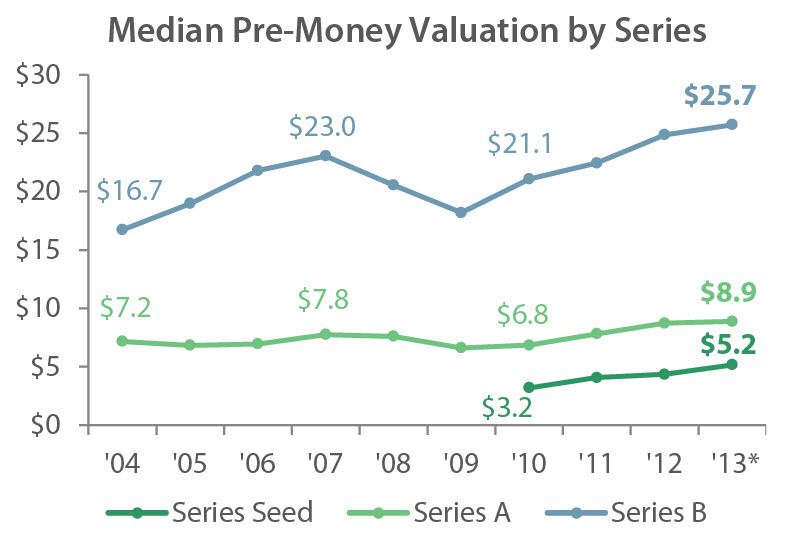 In doing research for our upcoming 4Q 2013 Venture Capital Valuations & Trends Report, PitchBook has found that the median pre-money valuation for all companies at the seed stage has nearly doubled over the last three years from $3.2 million in 2010, when seed financings became prevalent, to $5.2 million through the first three quarters of 2013. The data show that Series A valuations are also increasing, but at a slower rate—from $6.8 million in 2010 to $8.9 million through the first three quarters of 2013. High seed-stage valuations are likely having a major effect on startups’ ability to raise a subsequent Series A round, as investors at the seed stage want to see appreciation in their investment but Series A investors often believe that the valuation at the seed round was unduly inflated. And, as mentioned in previous PitchBook reports, the number of seed rounds has grown over the last three years, which has resulted in early stage and later stage financings shrinking as a percentage of the overall VC pie. All of this points to a more difficult financing environment for companies raising a Series A round and for VC investors hoping to pick out seed-stage companies with solid growth prospects but at a reasonable valuation. This narrative fits right in with most explanations for the “Series A crunch,” which many say exists as a result of the explosive growth of seed and angel rounds. Capital requirements for starting a business are much lower now than five years ago, and the percentage outside investors are acquiring has remained relatively steady at the seed stage from 2010 to today, providing a greater incentive to start and fund young startups. To illustrate the problem, PitchBook data show 281 U.S.-based companies that received seed funding in 2010 or 2011 and have failed to take the next step to a Series A round. Of those 281, 59 raised a seed round of more than $1 million—the median seed/angel deal size in 3Q 2013—and have yet to receive follow-on financing. Some larger examples include SciFlour Life Sciences, which raised $5 million in seed funding in May 2011, and SurDoc, a cloud storage company that raised $4 million in December 2011. Some of these companies are backed by well-known investors like Battery Ventures, First Round Capital and Greylock Partners, to name a few. Whether the Series A crunch continues or fades away will depend a lot on valuations at the seed stage, as well as the total number of seed rounds. But if recent fundraising numbers are any indication, this rash of seed deals should continue in the coming quarters; 49% of the funds closed since the beginning of 2012 have less than $50 million in capital commitments. For a more comprehensive look at our VC valuations, be sure to visit pitchbook.com next week to download our 4Q 2013 Venture Capital Valuations & Trends Report.